This week’s column is a bit unusual. Instead of looking at the differences between solar panel models, brands and technologies, I’ll be considering the physical principle that unites them all. It’s called the photovoltaic effect, and it was demonstrated as long ago as 1839 by Becquerel. These days we recognise photovoltaic effects as yet another useful quality of semiconductors. Semiconducting materials, including silicon, gallium and germanium, all conduct electricity — but only under specific conditions. 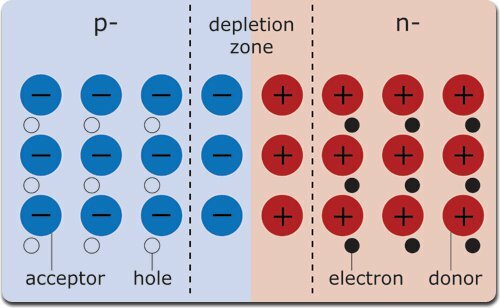 All semiconductors belong to one of two types: P and N. P-type semiconductors tend to pick up a small positive charge, and N-type ones a negative. This turns out to be enormously useful in making small electronic circuits, but that’s too big a story to get into here. Let’s just say that semiconductors revolutionized electronics and that they’re used in most of the devices around us, everything from cellphones to airplanes. But I was gonna talk about solar panels, right? Inside every solar panel is a sandwich of two of those semiconductors, one layer of P-type and one layer of N-type. (Top marks if you said “Hey, that looks like a battery.”) You’ll find sandwiches like this in chips, too, but the semiconductors used in solar panels are chosen for their photovoltaic properties — light increases their tendency to acquire a charge. How does that play out? Well, in bright sunlight, the electrons in the N-type silicon start going doolally. Excited by the light, they rush out of their home N-type layer and stream towards the positive charge in the P-type. Wire up the two layers, and you can harvest a useful electical current off that stream of electrons. With enough panels, you can power a cellphone — or a city. It took a century to figure an application for Becquerel’s discovery. Now there’s a global market for solar panels and we’re getting better and better at making light nto electricity. Who knows where we’ll be in another 100 years?